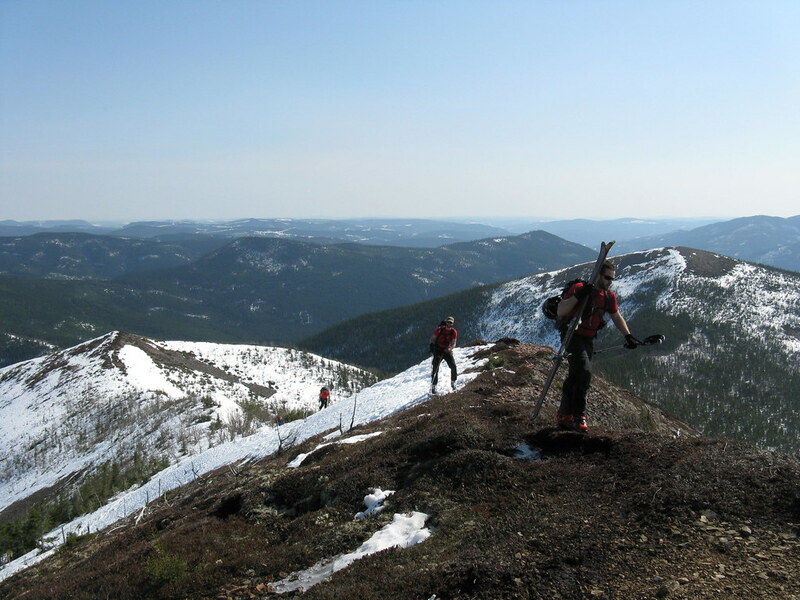 When travelling the backcountry in high snow, do snow shoes or skis perform better? By "perform better" I mean how tiring and fast travel is. Is there a general answer, or does it depend on the conditions like kind of snow and depth, temperature, slope etc.? Under which conditions would snow shoes perform better, under which skis? I am asking about multi-day trekking on unprepared ground. Summary from a winter spend in Winnipeg long ago compared to Central European conditions: there are probably good reasons why native North American people went with snowshoes while native Europeans invented skis. or rugged terrain. Canadian Shield outside Winnipeg is macroscopically flat, but has rock structure that has you climb up or down a rock every few minutes, and crevices mean that skiing looks somewhat acrobatic meandering between rocks and bushes. For steep climbing, many modern snowshoes already come with either crampons or teeth at their frame. If you have long up followed by long down, then ski with skin works well. If its just all the time up and down, putting the skin on and off again takes too long. But V-style/skating/herring bone pattern (don't know the proper English term) ascend a) takes a lot of strength and b) needs a wide trail. If the snow is compact so both skis and snowshoes will stay on top, then skis are much better because they glide. Unless it's actually ice: snowshoes with crampons or teeth in their frame provide easier going on ice. Or the occasional rock. With snowshoes you don't need to worry as much about that occasional rock peeping though the snow. If the snow is deep but not very compact snowshoes require a lot more work because you have to lift them out every step while the ski stays on one level. when it is very cold the skis don't glide any more. This happens somewhere between -25 and -30 °C IIRC. Snowshoes still work as always. I remember a ski tour in the Krkonoše where we had had a lot of fluffy new snow with a layer of harsh ice on top. We were with camping backpacks and were breaking through the harsh with every step. But leaving the skis below the surface didn't work, neither because the breaking the harsh with the shin was too hard (and it actually cut). Snowshoes would have been much better there. snowshoes work quite intuitively. Put them on and get going. But you are forced to make long and wide steps. If you are not used to this, it can be very exhausting. I was also told that beginners are at risk of inflammation of the inner tendons in the upper leg (the ones that pull your legs together) if they overdo it. skiing requires technique to get efficient. If your skiing techique isn't yet there, that can be quite exhausting as well. somewhat depending on the skis, but if you have XC skis that work well for you with a day tour pack only, their glide zone will be flat (i.e. not gliding/not gliding well) if you carry a camping backpack. Of course, there's a similar trade-off for snowshoes: larger ones provide more floatation but require larger steps and are heavier. You have to decide whether you accept sinking more deeply with heavier backpack or working harder than would be needed when with a small backpack only (there's of course also the option to have more than one pair, and there are add-on tails that provide more floatation). If the terrain is sufficiently open, you can put your backpack into a toboggan/pulkka to avoid this. Also helps when snowshoeing to not sink in as deeply. Toboggan + XC ski downhill does require much better technique. In the Canadian Shield, we often took both skis and snowshoes and changed every once in a while. As we basically used canoe routes, skis were the major means of going. The additional pair of snowshoes didn't matter on the toboggan (and the terrain is macroscopically flat, so it's not that you think very much of how to carry this additional weight the next 1500 m of elevation gain). As I was a beginner with both, switching back and forth allowed me to get much further, I'm not sure whether I'd have been able to keep up with the experienced members of the group for 20+ km per day otherwise. From my current home (Frankfurt), both make sense only if you go for winter holidays somewhat regularly. Also snowshoes are easily in the 150 - 200 € category. And bad snowshoes can be super annoying (just like bad skis). Cheaper: some friends bought XC skis they had rented at end of the season. In Central Europe, your chances with used but good stuff are decidedly better for skis than snowshoes. The same goes for end-of-season sale. I was actually renting the snowshoes, so over the winter I tried out a number of different ones. There were some hard plastic ones that probably would have allowed a bit of gliding and that where considerably lighter than the alu frame plus neoprene variety. But I decided I'd never take them again because they were making noise (clattered like hitting two wooden sticks together) with every single step. For both skis and snowshoes try out how the binding works with gloves (or even mitts). Maybe the additional $€ for the manual ski binding are well invested. First off, I want to make clear that this applies to skiing and snowshoeing as a means of long-distance travel. It doesn't directly apply to skiing in specifically for the descents. The snow on frozen lakes tends to be firmer and this enables the ski's inherent advantage, glide. Even when pulling a sled, skis will be faster as long as the user has enough grip to propel forward. This is open for debate, as not everyone agrees on which type of ski does better, but for long-distance travel in deeper snow, skis are more performant overall. Wider skis float, and given their length, they almost float as well as snowshoes, but it's not usually required to lift the legs as much as with snowshoes. With thinner skis that sink much deeper, it's possible to simply drag one's feet and 'submarine' the skis. This is much less tiring on the quads. Self-explanatory, but it needs to be said that thinner skis don't do as well on steep descents. They are fast, but they don't give as good control as wider ones do. If there is significant chance of having to cross dense forest (tree spacing is smaller than ski length), then it's extremely slow and cumbersome to do on skis. If following natural features likes frozen streams and valley bottoms, natural barriers like small cliffs, cascades, waterfalls and other sharp terrain features make skiing hell. Snowshoes are much better at dealing with them. I made it a separate section because sometimes one is following perfect skiing terrain and then appears a patch of blowdown (fallen trees), bent over saplings (either conifers covered in snow or deciduous covered in sleet ice), or boulders. If there is enough of it, the skis' advantages can be nullified trying to get through these isolated hurdles. If the terrain is open and mostly smooth (regardless of slope), I'll choose skis. If the terrain is rugged or I know I will cross enough forest patches, I'll choose snowshoes. If I face a very long open approach with a relatively short forested uphill at the end as the goal, I'll bring both. The critical step is planning. For multi-day trips, it's possible to choose a particular route so avoiding forest is more viable. For day-trips, I often take shortcuts through the woods to reduce distance but it limits which tool to bring. This is probably why most people make this decision. Cross country skis are a lot more expensive than snow shoes. So if you’re not actually planning on skiing you wouldn’t buy skis! Generally (though this depends on the make/model) snow shoes can cope with steeper ground than skis. I’ve certainly seen videos with CC skiers using snow shows (coupled with crampons) to ascend very steep terrain even though they’re carrying skis. Skis are a lot faster than snow shoes. You can ski up a reasonable slope a lot faster than in snow shoes. Snowshoes are bulky and awkward to walk in. In skis you can ski down (!) in snowshoes you have to walk. :( This is obviously disadvantageous to the shoes. This is quite variable, but big snow shoes (those with a large profile) can enable you to walk though deep powder where CC skis would struggle. In addition to the other answers: you might take a look at snowblades. These are very short skis, which means that you can both ski and relatively easily cross forests. Bear in mind that next to advantages of both, they have disadvantages of both as well. It may be wise not to use them if you don't have experience with them. Not the answer you're looking for? Browse other questions tagged winter snow cross-country-skiing winter-walking snowshoeing or ask your own question. What could be a long and scenic two days backcountry ski tour in Switzerland, bivying on the snow? Which country has the most snow days in Europe?